The early inhabitants of Merida "discovered" a plant that had been a well-known staple to the indigenous Maya of the Yucatan Peninsula: henequen (agave sisalana). A versatile, spiky, cactus-like bit of green that yielded valuable hemp, it soon earned the name "green gold" (verde de oro) because of the wealth it lavished upon the millionaire hacienderos who farmed this cash-rich crop. A look-alike for the blue agave cactus used in making tequila, henequen (also called sisal), still grown and processed in the Yucatan, has been relegated to the back burner in favor of a 20th century, man-made fiber that is stronger, more durable, and cheaper to produce: nylon. That, plus competition from many of the world's developing nations, has put an end to sisal as a major Mexican export. By 1927, there were 658 haciendas growing and processing henequen; today, there are only a few. Today, as you stroll along Merida's fashionable, Paseo de Montejo, with its beautifully preserved French-style mansions (once the lavish residences of henequen barons) that line both sides of this boulevard, one can only imagine what life was like when sisal was king. Who lives in these opulent homes now? Only a few are privately owned; the others are now the offices of major insurance companies and banks. Even the Casa de Montejo, built around 1550, home of several generations of the Montejo family (and named for the founder of the city, Francisco de Montejo el Mozo) is now a bank. In 1542, the Conquistadores captured the Mayan stronghold of Ichcaanziho and renamed this ancient city Merida, because it reminded them of the city of Merida back home in Spain. A Maya stronghold long before the arrival of the Spaniards, Merida still has its roots in the Maya culture, but is now peppered with European touches as well. Dazzling details like tree-lined boulevards right out of a picture postcard sent from Paris; filigreed wrought iron railings reminiscent of old Spain; beautifully carved wooden doors; marble and mosaic floors; walled gardens; and ornate fountains. They call it the "white city", La Ciudad Blanca because it's so clean and white. It sparkles in Merida's brilliant and perpetual sunshine. Merida is a genteel, laid-back colonial city with a population of 700,000 and, paradoxically at times, it's a bustling, sprawling traffic-clogged metropolis just like other cities of its size. The Spaniards built the Plaza Grande (the zócalo) on the rubble of the ancient pyramids of T'hó. This is the colorful heart of the city, with shops, restaurants, and hotels just blocks away. Visitors who come here on fiesta days, when the locals display their wares, are in for a treat. On one side of the zócalo is the Palacio de Gobierno and its arched courtyard, housing the murals of a local Yucateco artist, Francisco Castro Pacheco. The murals portray the history of the Yucatan. It is open daily and there's no admission charge. The man who was the architect of the famous Morro Castle in Havana (Juan Miguel de Aguerro), built the Cathedral, facing the zócalo which was completed in 1598. It is the oldest cathedral on the North American mainland and contains many priceless relics. One of the most beautiful representations of Mayan life is housed in the Museo de Antropología e Historia. It's a good place to start before touring the nearby Mayan ruins. Merida is close enough to the Mayan ruins at Chichén Itza and Uxmal and it's possible to do either on a one day trip. The Convent Route (La Ruta de los Conventos), easily done as a day trip, is dotted with a string of 15th and 16th century convents/churches well worth visiting. Mostly Franciscan in origin, some of the convents are quite ornate; others are eloquent in their simplicity. A highlight of the route is the village of Acanseh, and its convent which is directly opposite a small, but ancient pyramid. A good time to visit is on December 12, when the locals celebrate the feast of Mexico's patron saint, the Virgin of Guadalupe. Other villages like Tecoh, Tekit, Mama, Chumayel, Teabo, Tipikal, Mani and Oxkutzcab are also interesting. 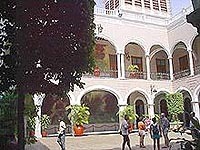 Mayaland (800-235-4079), with several locations in the city, operates tours along the convent route and to the nearby archaeological sites. The best way to tour Merida is on foot, but it could be more fun on a horse-drawn calesa. There are also public buses, taxis and rent-a-cars. But if you plan to walk the city, look for the two-seater confidenciale benches which are perfect when your feet give out and you just want to people-watch. Very romantic for two.